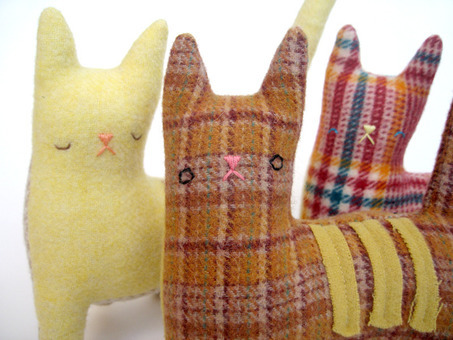 Kitty no.203 has an orange plaid body with a gold tummy and stripes. It has a quirky, hand embroidered face with black eyes and a pink nose. Kitty no.203's legs are uniquely positioned so that you can see all four legs at once. It is made out of high quality, woven wool that has been felted, and is stuffed with eco-friendly fiberfill.